What a way to start spring break! Jodi Picoult came to Kansas City for an autograph signing sponsored by Rainy Day Books (and today was indeed a rainy day). My daughter and I purchased tickets to this event weeks ago and my husband drove us to the plaza for this special occasion. As we entered the auditorium we were told to stand in line for our personalized autograph of her newest book, House Rules. This seemed somewhat out of the ordinary, as most other events I have attended the author reads a passage from the book, answers audience questions, and then autographs the books. They had to do things a bit differently today as Jodi was on a three-city tour in a single day: morning in Minneapolis – afternoon in Kansas City – evening in San Diego. Since she had a tight schedule in order to catch her plane, they began autograph signing early. She went on to say that communication methods (or lack thereof) of a person with autism – not making eye contact, speaking in a flat voice, not understanding traditional social cues – are all signs that the police interpret as ‘guilt’ As with many of her book inspirations, Jodi began to think “What If….” What if a child with Asperger’s syndrome was perhaps in the wrong place at the wrong time and because the communication skills indicate guilt, the police believe he is a prime suspect. As she later said in the question and answer period, when she sees our legal system being ridiculous, she feels the need to report that to the populace. Jodi read several pages of the first part of the book. The first chapter is written from the mother’s Point of View. Emma gives us a brief look at what it is like to live with a high-functioning autistic. She relays a poignant scene of being in the grocery store and her son having a total meltdown because the “sample lady” was not at her normal post on this particular Saturday afternoon. As Jodi was reading from her book, I noticed a lady in front of me wipe several tears from her eyes. This situation is obviously not that uncommon for those who are familiar with this disorder. The next chapter Jodi read was from Jacob’s Point of View – the boy who has lived with Asperger’s his entire life. Jacob gives us an inside view of what it is like to be different from the norm, know you are different from the norm, but also know that there is nothing you can do to become more accepted. One of Jacob’s interests is crime scene investigations and he has memorized all 114 episodes of CrimeBusters, although that does not prevent him from watching the show each and every day at 4:30PM on the USA Network (page 20). This special interest is what prompted Emma to give Jacob a police scanner radio, which he listens to on a regular basis and occasionally even ventures to the crime scene. This is how the conflict begins: Jacob hears a report for a “10-100” – a dead body – and curiosity gets the better of him. He sneaks out of the house and rides his bike to the state highway where a dead man has indeed been found half naked lying in the snow. The final chapter she read to us was from the police captain’s Point of View. Rich and his fellow officers are trying to decide if this dead body is a suicide, homicide, and/or a victim of sexual assault. You can imagine his surprise when Jacob appears out of the shadows and informs him that none of those assumptions are correct; the man died of hypothermia as seen on episode 26 of the second season of CrimeBusters (page 34). Several in the audience were teachers and having already read the book, they were astounded at her ability to create Jacob in a way that rings true with their encounters with Asperger students. Prompted by that comment, Jodi then explained the research she did for this project. At first she visited a special school in Pittsburgh where she had the opportunity to interview six students and their families. This allowed her to get face-to-face with the students and really understand what it was like to try to communicate with them – and see them try to communicate with her. After obtaining this research, she went home and developed an in-depth questionnaire which she distributed to 35 students and their families through an Autism foundation in New England. This yielded hundreds of pages of research. Through these 35 contacts, she met one particular student, Jessica, who became an integral part of the book project. Oftentimes Jodi would send a scene to Jessica to ask if it rang true and Jessica would provide critical constructive feedback. Jessica, who is now a freshman at UMASS in Amherst, MA, was a beta reader for the finished manuscript and once she gave her seal of approval, Jodi was 100% convinced that she had adequately captured the voice of Jacob. At one point during the question and answer phase, someone asked Jodi about movie rights. OH boy, did she have an opinion on this topic. She asked the audience how many saw My Sister’s Keeper (to which many raised their hands) and then she asked the audience how many were angry at the ending (to which Jodi raised her own hand). Jodi compared an author giving movie right consent to that of a woman giving up a child for adoption. There are some adoptions that take place and the child grows up in a nurturing family and becomes a fine upstanding citizen; and there are other adoptions where the child is raised by crack whores. Ouch! I did read the book and loved it; but I must admit that I am now glad that I did not see the movie. Somehow this topic segued into Jodi’s writing process. Jodi shared that it takes her approximately nine months to write a book – literally, it is like giving birth to a child. She spends several weeks conducting research, and she is usually editing one book while writing the first draft of a new one. She spends approximately three months out of the year promoting her books. Jodi said that she cannot remember a time that she did not enjoy writing. She remembers writing her first “book” at the age of five entitled, The Lobster that was Misunderstood. It was quite interesting to hear that Jodi’s 14 year old daughter seems to be following in her mother’s footsteps. Just recently she told her mom that she had a great idea for a children’s chapter book and when Jodi heard the idea, she agreed. Now mother and daughter are collaboratively working on this project. How cool is that?! Someone asked Jodi which one of her books did she consider a favorite. Her answer: Second Glance (I have not yet read this – but I obviously need to do so). Someone then asked Jodi what authors she enjoys reading, to which she answered Alice Hoffman, “I would read her grocery list”, Chris Bohjalian, and Anne Tyler (ok – more books to add to my TBR pile). Someone else asked her what advice she would give to aspiring writers, to which she answered WRITE….if only for 20 minutes a day, just write. She also said that anyone serious in writing should attend at least one writer’s workshop. To be successful does not require a MFA degree, but it does require a thick skin and the ability to accept criticism. She writes about issues that keep her awake at night. She figures if it is an issue that has her worried, it must be a worthy topic for a book. As mentioned before, she likes to ask the question, “What If….” Her newest book, Sing You Home deals with the issues of embryo donation and gay rights. The protagonist of the book is Zoe, a music therapist who uses music to help heal patients and victims. The unique quality of this newest release (spring of 2011) is that it will also include a music CD in which Jodi wrote the song lyrics and her good friend wrote the music. Not only will the reader be able to read the words, but also hear the sounds of a highly emotional story. To continue this theme, the book is not divided into chapters but rather tracks. The two hour event was over before we knew it (I could stay and listen to her answer questions all afternoon), and both my daughter and I had such an enjoyable afternoon. In fact….I was so thrilled to be a part of this event that I decided to have Jodi autograph a copy of her book for one of you! Molly …Lucky you. This info about why she wrote the book was interesting. Hope I get to start the library copy this week. Wow, that is absolutely amazing that you got to go! She is my favorite author, I am so jealous! I love what she said about the movie. I was very disappointed in it as well. My favorite book is hers is My Sister's Keeper. So incredible! I am a follower of your blog (Google Friend Connect) and would absolutely love to be entered in this drawing!! Molly, thanks so much for taking the time to share this with us. What a wonderful event. You did a good job of putting us in the seat beside you! My favorite Jodi Picoult book is still the first one I read, THE PACT. Thanks so much for the giveaway. It was very thoughtful! Thanks for sharing this event with us, Molly! Jodi will be in the LA area later this month as part of the book tour, but I won't be able to make it to see her, so I'm glad to have experienced it vicariously :-). I've read practically every one of Jodi's books, and it's hard to pick just one favorite, but I think mine is one of the older ones, Perfect Match, with Nineteen Minutes a close second. I'm very interested in this new one, too. Please enter me in the giveaway. I'm a follower/subscriber. Thanks for writing and sharing this event. I am a follower on google reader so I don't know if that counts. I am also kind of shy and don't comment much but I enjoy your blog. My favorite Jodi Picoult book is definitely Nineteen Minutes, I couldn't put it down when I was reading it! Oh Molly-I am so jealous of you! It doesn't seem that the authors I really like ever come to Seattle! You post about this event is fabulous and I must say that My Sisters Keeper is my favorite so far–although this new one sounds great too. Love the comparison between movie rights and giving a child up for adoption! I still haven't seen My Sister's Keeper, but it is my favorite of her books. This sounds like a wonderful event. Nothing like hearing an author! I'm not a Jodi Picoult fan, but I'd love to share this new book with a friend who has a son with Asperger's. It looks like you had a fabulous time! I really enjoyed reading about your experience at the book signing and reading. It was interesting to read her view point on the movie rights. You would have thought they would love to see their books on screen as they then reach a wider audience, but I understand what she means, it must be like giving your child away. What a wonderful event! I so miss going to Rainy Day Books events now that I no longer live in KC. I'd love to win a copy of the book. I am a follower as well. My favorite Picoult book is still the first one I read: Keeping Faith. Molly, what an excellent post! 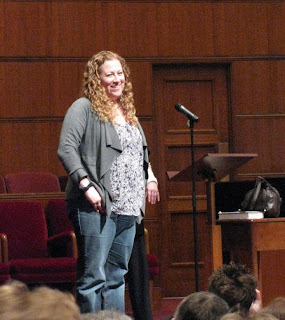 I've never had the pleasure of attending a Picoult reading, but I felt like I was there as I read your post. Thanks so much for the giveaway. My favorite book of Picoult's so far is probably Plain Truth. I loved reading about her reaction to My Sister's Keeper. I saw that movie last night. I'd love to be entered. The first book I read of hers was The Pact, so that was probably my favorite. Oh, you are so fortunate that you got to attend this event! I am reading House Rules this week. I love how she picks an issue, obviously researches it, and turns it into compelling literature. I didn't like the ending of My Sister's Keeper (the movie) either! I love hearing author's in person. It makes me love and appreciate their work even more!!! It's a tie between the first Jodi Picoult I read, Picture Perfect, and My Sister's Keeper. Both made me want to turn the page and they expanded my interests and knowledge. They made me want to know more! I would love to read this new one! Thanks for a great review. What a great experience! I love your post and the pictures here! I would love to hear Jodi Picoult talk – it sounds as though she is really interesting – thanks for sharing! I have been looking at this latest by Picoult and been tempted to pick up a copy…shat a fantastic post! I've heard other bloggers talk about what a great speaker Picoult is at these kinds of events. I have read several Picoult novels and really like the multiple POV she uses. Last year I read Nineteen Minutes and was mesmerized…so I guess that would be my favorite so far (although I've enjoyed them all!). What an awesome post! Jodi seems like such a wonderful lady!! I would love to have the chance to meet her someday! I would LOVE to be entered in this contest! How exciting!! As far as a favorite by Jodi, that's such a hard one! I think I would have to say either Change of Heart or Nineteen Minutes. I am listening to Handle with Care right now and am enjoying it. I am a follower of yours and have been for a while! Thanks for this awesome chance!! Have a great week! Thanks for sharing your experience! It sounds like a great reading. I imagine she was upset about the movie version of My Sister's Keeper. That is actually my favorite book by her … totally had me in tears. I won't see the movie since I know they changed it quite a bit. My favorite Jodi Picoult book is My Sister's Keeper. Also, I am a teacher, and follower. My email is kikiv68@yahoo.com…I want to win! I read my first Jodi Picoult novel several months ago. It was My Sister's Keeper, which I reviewed on my blog. It's wonderful how skillfully this writer employs multiple narrators, and how she writes about the important issues relevant to our times. House Rules seems to be especially pertinent, with the increase in autism in the U.S., which affects so many children, families, schools, and communities. My e-mail is lea724@gmail.com. I'm not a follower of your blog on your actual blog, but I do subscribe to your posts via Google Reader, if that counts! 🙂 It's hard to pick a favorite Picoult book, as I've literally read them all. I think I can narrow it down to the first two that I read: My Sister's Keeper & Keeping Faith. Those two just blew me away and made me a lifelong fan. What an awesome event! I love that Jodi says she would read Alice Hoffman's grocery list. I guess my most recent fave would be Nineteen Minutes. Thanks for the opportunity to win. I would like to read Change of Heart. I'm glad I found your blog just in time!! Jodi Picoult is one of my favorite authors. My favorite book of hers is Nineteen Minutes. It was the first of her books I read, and I was hooked! I love how you start her books feeling like you know EXACTLY how you feel about the topic and throughout the story she causes you to question and change your mind over and over. I am going to sign up to follow you right now! Hi there: Just discovered your site and have subscribed. I also just finished reading Nineteen Minutes, my first foray into Picoult. It won't be my last. I have 3 more of her books on my to-read pile. I think she is fabulous and would love to read this new novel. I am not entering and know your giveaway is over but just wanted to tell you how much I loved your post. I am so jealous of your being able to hear Jodi speak especially about HOUSE RULES. I have taught high functioning autistic Asperger children and read many books on it but this was my first fiction book and she did a magnificent job with it. I wish I could have heard her speak. If the book interested you, may I recommend COWBOY AND WILLS by Monica Holloway if you haven't read it? Just go to her site and hear hear speak briefly about her son Wills and their dog Cowboy and how he helped Wills with his asperger syndrome…I LOVE that book so much! Thanks for sharing a wonderful post!